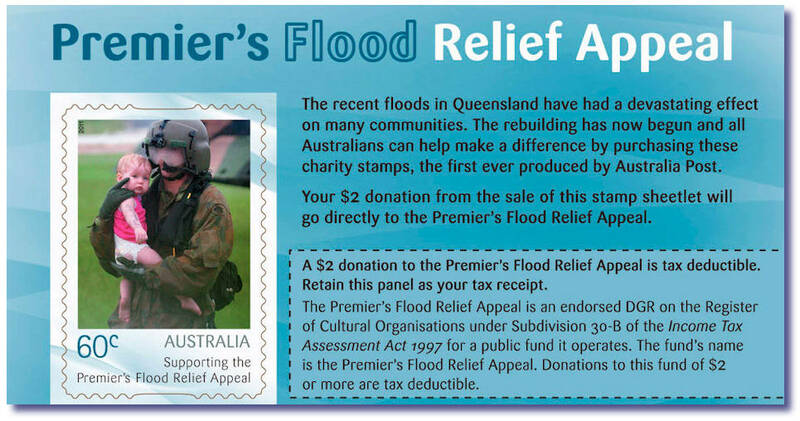 Australia issues Flood Relief Stamps. The unprecedented flooding this year in Queensland, and substantial loss of life, property and basic infrastructure, has shocked everyone. 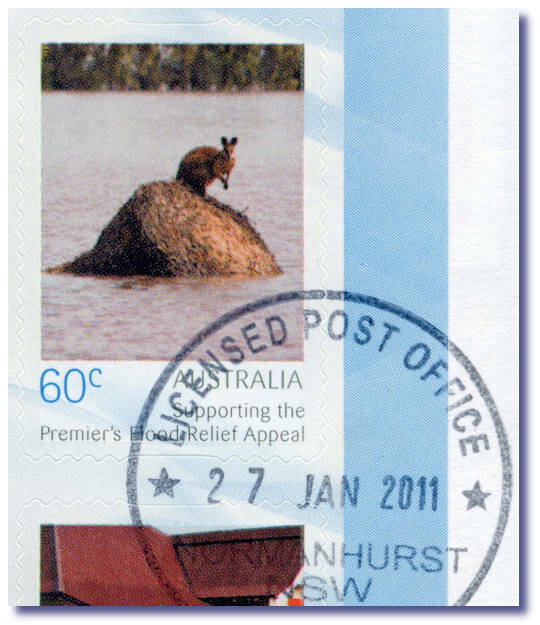 In a surprise move, Australia Post announced with only a day or two advance notice, that a set of five “Flood Relief” stamps would be issued January 27th. Media releases of the issue were only sent out at 2.15pm on January 25th. The next day, January 26 was a National Public Holiday for Australia Day. The stamps were issued nationally the following day, at 9am. Australia's first ever "Charity stamps"
The stamps were only available in a sheetlet of 10 x 60c letter rate stamps, all in self adhesive form. There were 2 of each design in this sheetlet of ten. The sheets were sold for $A8, and the $2 surcharge was stated to be earmarked for donation to the Queensland Premier’s Disaster Relief Appeal. Post Offices only sold sheetlets of 10, and did not sell singles, or any lesser numbers than ten. No booklets were produced, nor maximum cards, nor post office packs, nor First Day Covers. This was a true “Emergency” issue, done at breakneck speed. Whether these 5 stamps will be included in the 2011 “Annual Album” will be interesting to see. I think so. Being an official Post Office issue of 5 stamps, all collectors of First Day Covers WILL need these on FDC, to be “complete”. Given the scant 2 days notice of this rush issue, creating a First Day Cover was something very few would have done. Indeed most collectors would not be aware this stamp was even issued, until reading this column. I am a great believer that for such items, a REGISTERED cover is the only certain way to “prove” the cover was actually postmarked on January 27. Not a month or year later, via a likely backdated non-relevant local PO cancel etc, that I am sure some spivs will gladly sell you. The immediacy of the internet came into play here, and it is my guess that the bulk of the genuine First Day Covers existing, were done by members of stampboards. 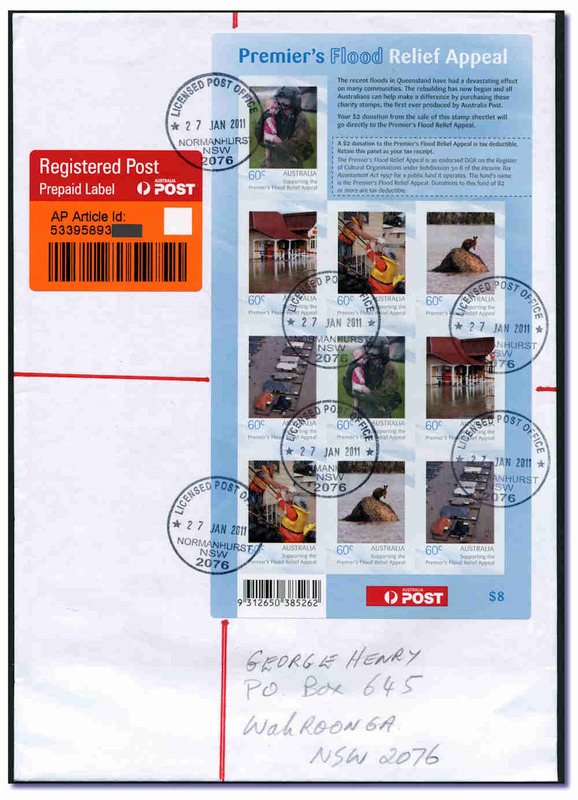 Stampboards.com member “BrissyPete” is based in Brisbane Queensland, centre of the flood area. The Brisbane GPO offered the official First Day national canceller – a rather amateur, very rushed looking thing - with 2 squiggly looking ‘waves’. At my suggestion, Pete offered to service real posted FDC on Jan 27 in person at the Brisbane GPO, for a very nominal fee above the stamp cost. I suggested members buy the full sheet of 10 on the FDC, rather than just the 5 singles. Most members elected to have theirs go through the post, and many wisely paid the extra few dollars to cover Registered Mail. http://www.tinyurl.com/FloodFDC shows most had their local post office backstamp them upon arrival, to doubly “prove” the posting date. With Registered mail covers, I suggested those collectors printed off the on-line AP tracking record, and folded that up inside the cover, with dated Receipt of posting. Why? As these will be valuable. Each Brisbane GPO Registered cover bearing a full sheet cost members only $A15 each, and my belief is they are a $A100 item already. And the genuine postally used Registered ones from Brisbane with arrival backstamps will go higher still in future, mark my words. A 1971 Xmas block 25 on FDC is a very rare item and sells for $A300. Why? As Australia Post also oddly did not offer that as a FDC option. One for the Kangaroo Stamp collectors! I did not buy any, as I did not want to be making money on the back of a disaster, but I ordered one to be sent gratis to Australia’s leading FDC collector, to whom I owed a favour! So, who said modern issues do not go up in price! Of all the unlikely areas to be setting price records, Mongolia is one that would come to VERY few minds. I’d have held that view recently too. The only reason I discovered the huge interest in the area, was when an unusual cover from the 1920’s turned up in a mixed lot I bought. I knew nothing of Mongolia or covers, and had no idea what the markings said, where it was addressed to, or anything else about it. It is shown nearby. In years gone by I’d have left such a cover in a box of oddments, simply as I had no way of knowing where it was going, or what it said. I am sure that is true of many dealers still today, and now in this exciting new internet world - that “too hard” cover no longer needs be the case. tinyurl.com/Kalgan is the extensive stampboards discussion on this cover, and as usual, the global audience were able to help, due to speaking and reading Russian, Chinese and Japanese. It now transpires the cover went from Ulaan Baator, April 21, 1926, to the North West border of China at Manchouli, with the correct 25c of Mongolian internal franking. There it was handed over to the Chinese postal service. This part of the journey took 2 weeks. 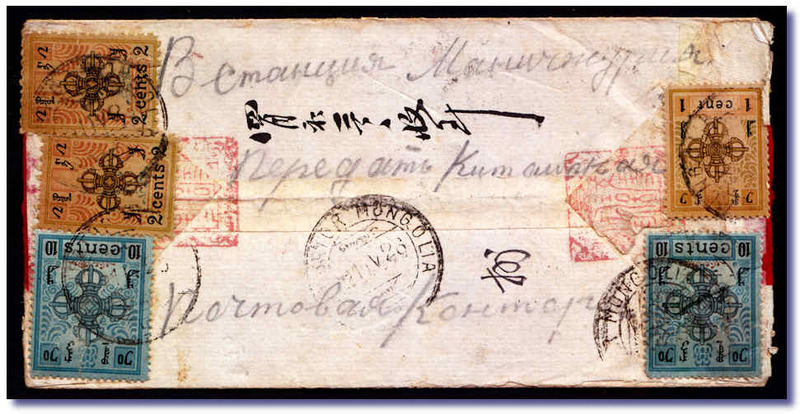 The Cyrillic writing on stamped side says – "At Station Manchouli, pass on to the Chinese post office." From there the cover made its way to the final destination of Zhangjiakou/Changchiakou/Kalgan in China. The sender and receiver appear to be Jade merchants. 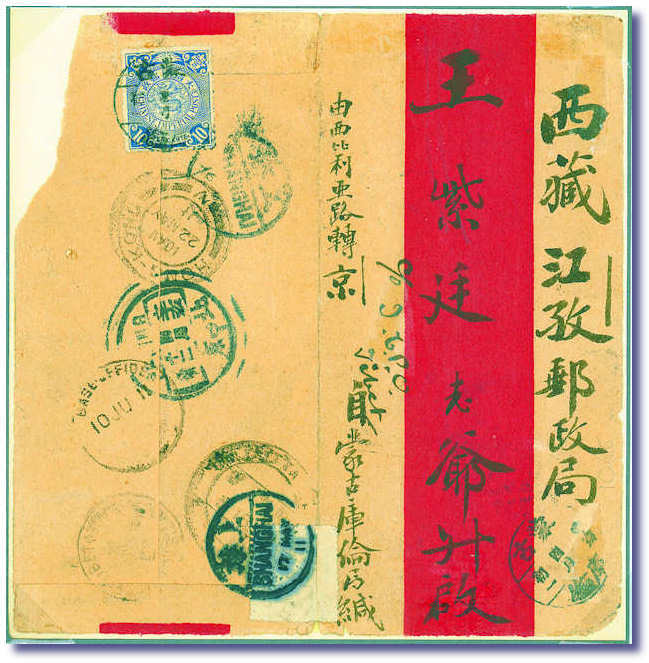 China at this time did not recognise Mongolian stamps as valid UPU franking, and insisted that all mail from Mongolia to China did one of the following. Prepay the Chinese internal postage with China stamps added in Mongolia. OR - be levied Postage Due at penalty rates, paid by recipient. This postage due was either by affixing Dues or other stamps (mostly seen) or via a red “postage due collected” type handstamp. This cover to Kalgan China oddly has neither, which makes it very unusual. None of which I knew about until last month! 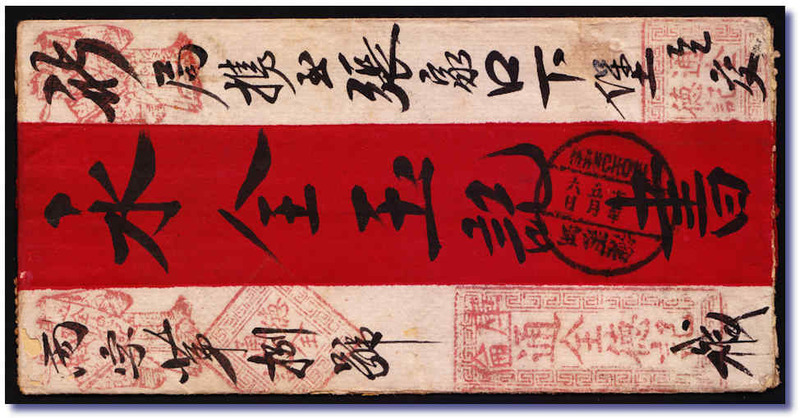 During the stampboards discussion it was mentioned that Spink in Hong Kong were holding an auction of Meiso Mizuhara's fine Mongolia covers of this era, that weekend. One of the members was attending, and he gave a very detailed summary of the sale and prices obtained on the link above. His feeling was the estimates were way too high, and he was hoping for a few bargains. The “way too high” estimates turned out to wildly conservative, and some pieces sold for TEN times estimate. The cover shown nearby is a opened out “Red Line” cover not dissimilar looking to mine. Indeed it is in far worse condition. It sold as lot 1545 for $HK3,628,050 – or around $US465,370 on the day. Pretty good for a ratty looking 1911 cover, with a chunk missing, and a common stamp affixed! This has the China internal postage being collected as was usual, via a 10c Chinese adhesive, worth only cents off cover. Other covers sold in the $HK millions league, often fetching MANY times pre-sale estimate. Why is Mongolia material so red hot? As the pre-war mails went through either Russia or China .. both areas with absolutely booming philatelic scenes, with large numbers of incredibly wealthy individuals. Did you know there once was an Australian Post Office concession rate for mailing pieces of wedding cake? I certainly did not, until a member on stampboards posted up the nearby images of a special stout cardboard container, holding a metal tin, made for just that purpose. tinyurl.com/KGVcake outlines the discussion that evolved from that member showing off his new purchase. Adelaide collector Martin Walker helpfully solved the mystery of how a small box was mailed for 2d – a rate that covered only half ounce letter post in this 1930s era. The box was mailed from remote North Broken Hill, to Kingswood in Adelaide, and was re-directed to Mitcham. It attracted an Unley transit cds along the way. 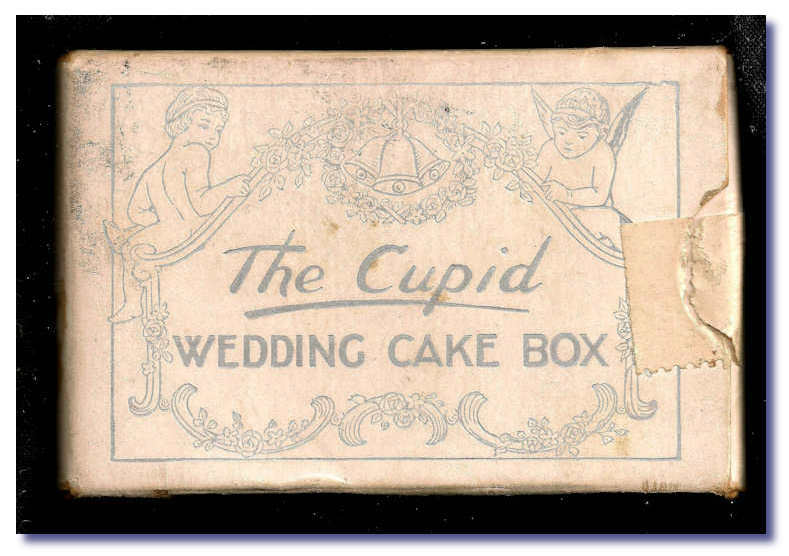 For mailing to Australian addresses, slices of wedding cake were accepted at the “merchandise or sample post” rate - which in the 1930s was 1d per 2 ounces Walker advises. So our cake above weighed 2 ounces. Mailing wedding cake to guests unable to attend was very common practice pre-war. The discussion thread above also outlines how fresh eggs used to be routinely mailed - also at a special rate .. safely and quickly. 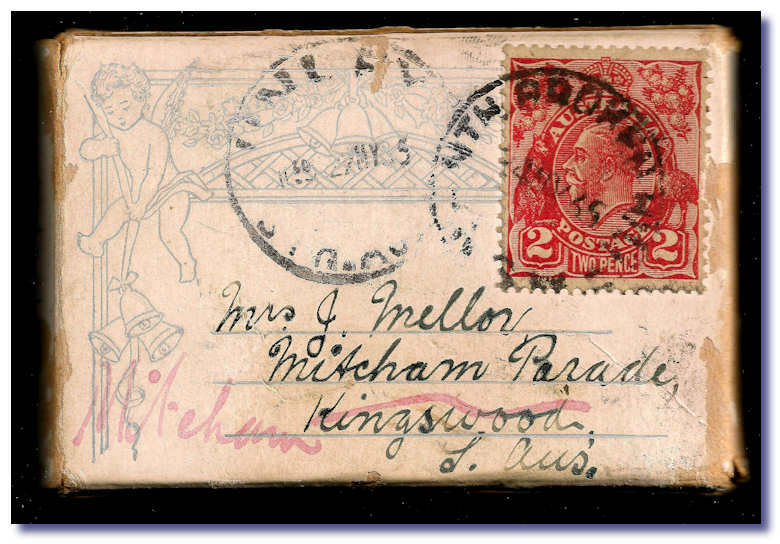 A quirky little postal history item, and a great addition to any KGV heads “usage” exhibit. 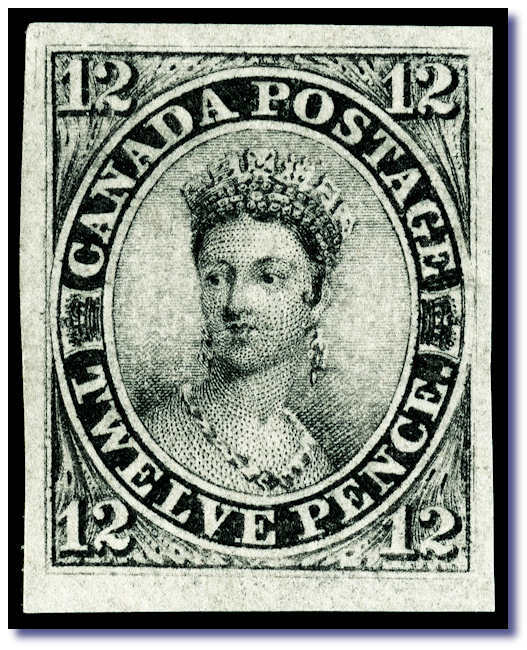 The best known stamp of Canada is without doubt the 1851 “12 Pence Black”. It has always been very scarce, and has always been highly catalogued. Only 1,450 were issued, and few survived. A MUH stamp from 1851! 2011 Scott catalogue is $125,000 for mint with gum, and $80,000 for no gum. It is also SG 4 catalogued at £170,000 mint, on vertically Laid paper. Shreves/Spink in the USA auctioned this lovely looking example nearby on January 27 and called it "The Black Empress"
Many thanks to Shreves for the high resolution scans .. probably the finest images of this stamp published in any magazine, anywhere. A range of wrong guesses! I ran a guessing poll on this stamp, and asked stampboards members to guess the price it sold for - without telling them the auction house. After 54 votes were cast – clearly some by folks who knew the actual result, we got the table nearby. The correct answer came in FOURTH! The stamp sold for $US489,000 when Buyer Premium was added. The correct answer (#6) came in fourth in this poll! tinyurl.com/Canada12d has all the comments made by collectors on this poll, and the likely value. The stamp was accompanied by a 1965 letter from J.N. Sissions, the highly regarded Canadian auctioneer. In addition, the stamp was recently submitted to the Philatelic Foundation in New York City to obtain an updated report on its genuineness and condition. Furthermore, the PF assigned the numeric grade of “Superb 98” to the stamp - a grade that is almost never assigned to any classic stamp, let alone a rarity. The last original gum, premium quality, mint example of the 12d Black was in Spink/Shreves November 2009 sale of the William H. Gross collection of "Important British North America". That copy realized $US299,100 (including the buyer’s premium). While the Gross example was a choice stamp, its margins are not near as large as those on “The Black Empress”. More significantly, it was hinged, as is every other known single or pair – except for the example auctioned recently. In general I feel anyone buying "MUH" high values even from 100 years back, needs to see a psychiatrist, due to the actions of re-gummers, but this one is totally beyond doubt. It is one of the most famous stamps on the globe in ANY condition, and to have one in genuine pristine UNHINGED MINT from 1851, almost beggars belief! In my view it was a bargain, and if I had the money I'd have bought it in a heartbeat. Someone will do VERY nicely out of this next time it is sold.